Shake container before each use. Mix 1 scoop in 8-10oz (250-300ml) of cold water and drink between meals. 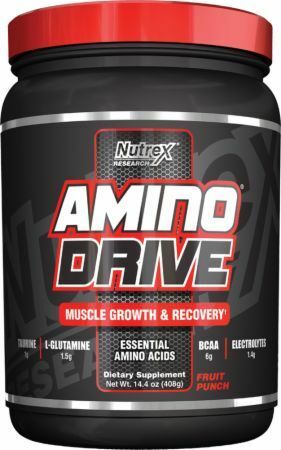 AMINO DRIVE® can be consumed multiple times a day. On training days drink 1 serving 30 minutes before or during exercise.As individuals vary so will results from using this product. Manufactured on equipment that processes products containing milk, eggs, soybeans, shellfish, wheat and tree nuts. Citric acid, natural & artificial flavors, acesulfame potassium, sucralose, silicon dioxide, FD&C blue 1. For Training Days: Mix 1 scoop in 12-16 oz of cold wter. Consume either 30 minutes before or during exercise. For Non-Training Days: Mix 1 scoop in 12-16 oz of cold water and consume throughout the day. As individuals vary, so will results. Citric acid, natural and artificial flavors, sucralose, acesulfame potassium, silicon dioxide, FD&C red 40, FD&C blue 1. Directions for Training Days: Mix 1 scoop in 12-16 oz of cold water. Consume either 30 minutes before or during exercise. Directions for Non-Training Days: Mix 1 scoop in 12-16 oz of cold water and consume throughout the day. As individuals vary so will results. Citric acid, natural & artificial flavors, sucralose, acesulfame potassium, silicon dioxide, FD&C red 40. Citric Acid, Natural Flavors, Silicon Dioxide, Sucralose, Acesulfame K.
When should I take Amino Drive Black? Does Amino Drive Black contain stimulants? Blackberry Lemonade This is a Buy 1 Get 1 FREE offer! Peach Pineapple This is a Buy 1 Get 1 FREE offer! Wild Cherry Citrus This is a Buy 1 Get 1 FREE offer!